Our residents, volunteers and staff had a wonderful trip to Matfen Hall last week, where they enjoyed a sumptuous afternoon tea with cakes, scones and pastries in the Library. This is one of our favourite outings and is always very popular, and we had some lovely feedback from our residents about the wonderful, historic surroundings of the hotel and the delicious food. Thank you, as always, to the Matfen Hall staff for looking after us so well. 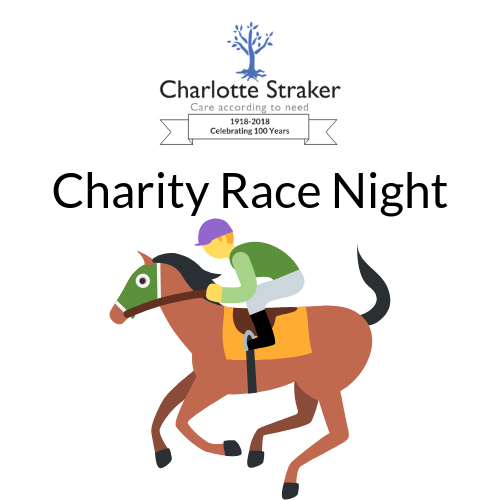 Our Activities Coordinator Jayne is organising a Charity Race Night on Saturday 23rd March at the Corbridge Corstopitum Club, with all proceeds going towards the Charlotte Straker Project. Entry is only £3 per person. Jayne is also holding a raffle on the evening, and would be very grateful for any bottle donations (which can be dropped off at our office on Monday to Friday between 9 and 5pm). If you would like to book a ticket please email jayne.purvis@charlottestraker.org.uk or by ringing 01434 633 999. Conrad Dickinson – “To Antarctica” charity talk at Corbridge Parish Hall. Famous explorer Conrad Dickinson will visit Corbridge to give a one-off illustrated talk on his journey to Antarctica, with Prince Harry and four wounded servicemen. Conrad hit the headlines when he guided Prince Harry and a group of injured soldiers on one of the most high profile expeditions of modern times. He is now going to talk about his amazing experience – which included sharing a tent with the Prince – in aid of the Charlotte Straker Project. Tickets only £10.00; Licensed bar. To buy tickets please email mike.pottage@charlottestraker.org.uk or ring the Charlotte Straker office on 01434 633 999. We held a moving Tree of Lights service yesterday at Charlotte Straker House. Jenny the vicar led the short service and residents, staff and visitors took the opportunity to remember and celebrate the lives of their loved ones. Thank you to the choir for singing carols, and to our volunteers for arranging mince pies and mulled wine. In total, 38 remembrance stars have been bought – thank you so much to all those who ordered an engraved star. We hope you will enjoy seeing them displayed on our Tree. Please remember you can pick up your star from our office during our usual opening hours. Jenny, the vicar, led the service. Our Tree outside Charlotte Straker House. A close up of one of the stars. Enjoying a mince pie and mulled wine. 24th Nov 2018 at Corbridge Parish Hall, 10 am – 2 pm. Our Crafty Women will have their own stall selling beautiful hand made shawls, cushions, Christmas decorations and homeware. 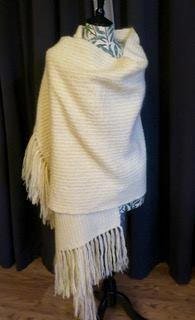 We are raffling a gorgeous mohair shawl in lemon (shown in picture below), hand made by Penny Ely. Raffle tickets are £1 and only available from the Fair. The Fair will have a raffle, tombola, cake and produce stall, toys and games for children and Santa’s Grotto. Coffees, teas, scones and home made soup available. Entry is only £1.50 (children free) and includes a Christmas cake raffle ticket. Please come and support our Crafty Women – all proceeds from their stall go towards the Charlotte Straker Project. Our Centenary Dinner was held last Thursday evening, to commemorate the culmination of 100 years since Joseph Straker bequeathed Prior House to the community as the Charlotte Straker cottage hospital. Held at the Corbridge Cricket Club House, the evening included a four course dinner, plus a speech from our Chair of Trustees Berenice Groves, and a very interesting talk from speaker Hugh Dixon, on the history of hospitals from the Middle Ages up to the founding of Charlotte Straker House. Thank you also to all the Trustees who worked so hard to organise such an enjoyable evening, plus Papaya Bespoke Catering for a delicious dinner, the Corbridge Cricket Club for allowing us to use their venue, JDC Laundry for the table linen and violinists Julia and Jill. Thank you to our Trustees Bill Cunningham and Richard Dixon for following photos!